Passengers have reported being split up even though the flight they were travelling in was not full. 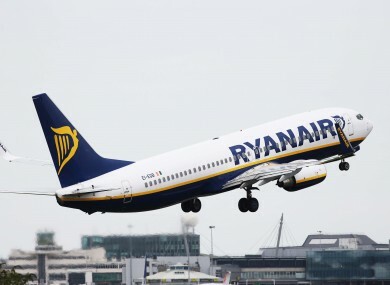 REGULAR RYANAIR CUSTOMERS have been strongly criticising the airline over its policy for allocating random seats to passengers who don’t pay an extra fee. A number of passengers have spoken to TheJournal.ie about their recent experiences flying on the budget airline, and being allocated seats far from family members and partners, despite having booked and checked-in at the same time as them. Passengers have reported being split up – sometimes many rows apart – even though the flight they were travelling in was not full, with many extra seats available. The issue is regularly raised by angry passengers on Ryanair’s customer service Twitter account. Ryanair gives its passengers the option of having a seat randomly allocated to them or of paying to choose their seat. Ryanair said this policy has been in place since 2014. However, in recent months passengers have been reporting being split up despite buying a ticket and checking in early. Ryanair denies it has changed its policy in any way since 2014. In a statement, the company said that it was busier than ever and as a result there were fewer free seats available. “Given we have a 95% load factor and we are carrying more customers, there are now less seats to allocate randomly,” a spokesperson said. A number of passengers have contacted TheJournal.ie raising the issue of allocated seating. Pearse Kenney from Galway travelled from Shannon Airport to Alicante with his partner, infant son, parents and step-parents. The family all booked together, but when Kenney proceeded to check-in, he found the entire family were sitting in different seats. “I saw we were all over the place. My dad was at the back, my mother was at the very front,” he said. Kenney said he paid about €45 over both flights to ensure at least one family member was sitting next to another. When he and his family travelled, he said that there were a number of free seats on both flights. Kenney said he hadn’t had issues in the past when he didn’t pay for a seat. One passenger described being on a flight in which a family of five – including very young children – were all seated in different areas of the plane. “Thankfully there was some room on the plane because people sitting nearby all had to move so the family could be seated together,” the passenger said. The crew were trying to keep track of who was sitting in what seat, while doing their other tasks. The passenger herself had been split up from her partner and friends on this flight, even though there were free seats on the plane. “The two seats next to me were free, as was the seat next to my friend in row 31, so there was literally no reason for our partners not to be seated next to us,” she said. A number of other passengers reported similar issues when booking and checking-in on flights. Every person who spoke to TheJournal.ie said that the random allocation was only a new issue. Email “Ryanair customers have been complaining about being seated rows apart on flights that aren't full”. Feedback on “Ryanair customers have been complaining about being seated rows apart on flights that aren't full”.